Birthdate: November 14, 1374 Type: Seirei Class Reiyoku Level: 5,000 Shaman: Umemiya Ryunosuke Tokagero is a 600 year old spirit from the same time as Amidamaru. He was a thief who was eventually killed by Amidamaru and because he wanted revenge he was not able to pass on. Because of his hatred he eventually turned his skin lizard green. 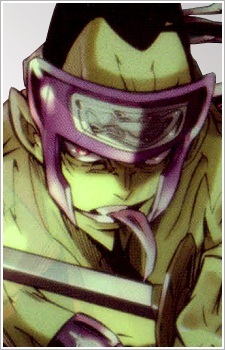 During his life time he became infamous and even gained his own fighting style called Tokage Kenpo (Lizard Style). He always calls himself a nasty villain but is in reality a big softie who only misses the comfort of a mother's care. When he was alive, Tokagero was a thief that was born into poverty. Tokagero was forced to eat his own dead mother to survive. He then became a thief ambushing people. An ancient bandit, he stole everything--money, food, lives and even more so. He led a horde of bandits who terrorized the area 600 years ago. There was a hill Tokagero and his group used as a hideout, but one day Amidamaru passed by and was ambushed by them. However, being the stronger one, Amidamaru killed Tokagero and his group. In the modern age Tokagero attacks Asakura Yoh and his friends in order to get revenge on Amidamaru, who does not recall him at all. Through Kyoyama Anna research, they learn that he is an obscure historical figure who was killed by Amidamaru. Tokagero possesses Yoh's friend Umemiya Ryunosuke "Wooden Sword" Ryu and uses him to steal the Harusame (Sword of Light) from the museum and attack Yoh and Amidamaru. The fight that ensues forces Yoh and Amidamaru to break the Harusame in order to save Ryu's life. Yoh appeals to Tokagero and allows him to possess him instead of Ryu, who is just an innocent bystander, because Yoh believes that Tokagero is not as evil as he claims. Togakero does so, with the supposed intention of killing Yoh in the process, but finds he does not have the heart to and leaves Yoh's body peacefully.